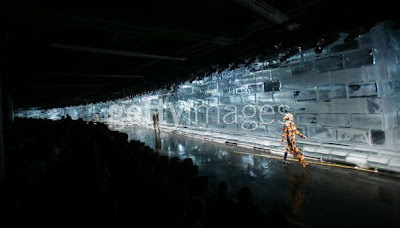 That, my friends, is the runway from Sunday's Y-3 Fall/Winter 2008 show at Pier 40. 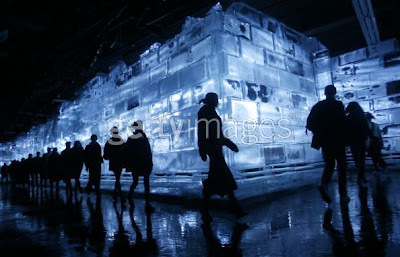 A solid wall of ice blocks, backlit at first by blue and green, which turned to this bright white when the show started. Before reaching this main area, we walked out onto Pier 40 through a darkened parking level, the way lit only by green light beams across the pavement. Once in, we were handed a double pack of Handwarmers (score!) and found super-soft cream fleece Y-3 blankets at our seats. I was located 6th row, about 30% of the way down the runway, and in front of the Japanese trendspotters. I uphold my earlier statement that I would (and want to!) wear everything ever produced by Y-3; that includes the plaid swag, Chanelesque jackets (typical Yohji), and head-to-toe scarlet. And yes, that is Irina Lazareanu pulling that suitcase below. Also spotted (model wise) were Jessica Stam, Freja Beha Erichsen, An Watanabe (whom I've met), and that really pretty Japanese male model who opened the S/S 08 show. There were also the requisite celebs, but whatever. 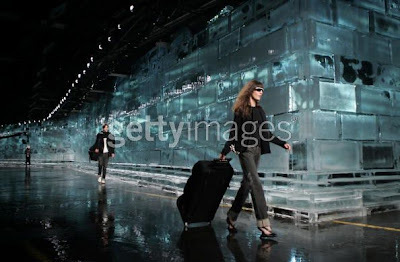 The show closed with the line-up backlit only by the super-bright ice wall, which then began a 2-minute simulated winter storm. I was truly freezing up in there. Alack and alas, Y-3 is hot.